UPDATE (1-21-2015): Now the QoW Winner will get 90 free bids! More info here. (2-2014) This promotion has been updated. Go here to read what’s new. Have you ever signed up to be our QuiBidder of the Week? 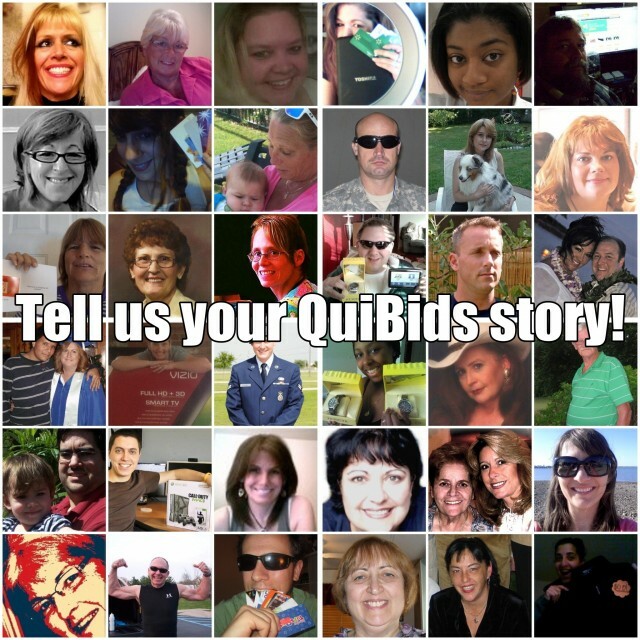 Every Monday we pick one customer and we share their story on our blog and across QuiBids’ various social media channels. In exchange, the lucky QuiBidder scores a 2X Gameplay and 100 Top QuiBidders Points. The best part of it all? You can win more than once! So there’s no reason not to apply each week! You must respond to at least two of the questions/prompts listed. You may choose to submit a video testimonial of yourself responding to the questions/prompts instead. Wondering just what those questions are? We’re glad you asked. Remember, you must submit answers to two of them, though the more questions you answer (and the more comprehensive your answers are), the more likely you are to be selected as our QOTW! 1. Tell us about your best QuiBids win. What did you win and how many bids did you use? How much money did you save? 2. Have you ever given the product you won from QuiBids as a gift to someone else? Tell us about it! 3. Do you use Buy Now? Why or why not? 4. What’s the most Voucher Bids you’ve ever won from a QuiBids Gameplay? What game was it? 5. What advice would you give to a new QuiBidder who is just starting out? 6. Anything else you’d like to say? Answer any of the questions that you wish, but remember that you must answer at least two of them, and the customers who share the most are more likely to be selected as the QOTW. How do I submit an outstanding QOTW answer? We know you want to dazzle us with your QuiBids experience and knowledge, so we’ll give you a few guidelines for how to write good answers to our questions and prompts. 1. Be yourself! If you’re a new customer who’s learning the ropes, say so! We aren’t going to favor customers with more experience necessarily — this contest is about you and how you shop on QuiBids, and how well you can communicate it to us! So be yourself, don’t pretend to be somebody you aren’t. 2. Think outside the box. We read through a bunch of these submissions each week and by and large — they tend to be pretty similar to each other. Send in something funny or clever that we can share with our customers instead of the usual ho-hum testimonial. Maybe something in a short narrative style, for instance? Copying and pasting a hyperlink to some other medium (say a Flickr slideshow or a YouTube video) technically qualifies as writing an entry, so feel free to do that. You’ve got the whole Internet at your disposal, so don’t be afraid to take charge of it. Good luck with the new QOTW contest and as always, happy bidding! Where do I go to leave a QuiBids review?